You probably learned in grade school that the earth’s core is incredibly hot. What if there was a way to capture that heat and turn it into electricity? Well there is, but it’s not easy. 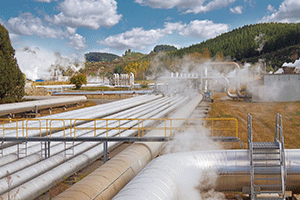 Enhanced geothermal systems (EGS) work by flowing fluid through hot rock below the earth’s surface and pumping it above ground to generate electricity. However, before fluid can be heated by the earth’s core, a fracture network below the surface must be created. This is done by hydraulic fracturing: a mechanical process that forces fluid underground at high pressures to create tiny fractures in underground rock. Scientists at PNNL developed an environmentally friendly “green” fracking fluid, called StimuFrac™. Rather than using large volumes of water and an immense amount of pressure to create fractures underground, this green fracking fluid relies on a safe chemical process to do the hard work. What’s in the secret sauce? A chemical reaction that occurs when poly(allylamine) and carbon dioxide (CO2) are combined. Think of the popping candy Pop Rocks© that “pop” when the ingredient CO2 comes into contact with your mouth. In a similar fashion, CO2 is added to the green fracking fluid and then reacts with the poly(allylamine) expanding in volume and creating pressure in addition to what already occurs during conventional hydraulic fracturing. Not only could PNNL’s StimuFrac™ use significantly less water compared to conventional hydraulic fracturing methods—making it more environmentally friendly—it is expected to also significantly reduce costs. The additional pressure created when using PNNL’s fluid means less mechanical pressure is required, potentially less water is used, and fracturing can be done more quickly. All of these factors combined could reduce operating costs by 60 percent while increasing permeability up to 10,000 times compared to conventional fracturing methods. Not only could the fluid be used in EGS applications, but it can also be used in the oil and gas industry. 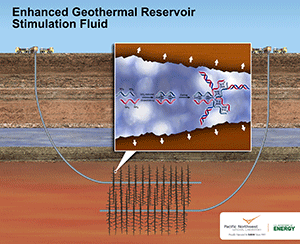 PNNL scientist Carlos Fernandez says “Though we initially designed the fluid for geothermal energy, it could also make unconventional oil and gas recovery more cost-effective and environmentally friendly." Learn more about licensing this technology here or read the full report here.